Learn how to stop Wordfence from blocking admin changes by white listing your admin IP address. Many WordPress site owners use various plugins to manage security. One of those plugins is called Wordfence which has a great suite of WP security tools to protect your website. However, Wordfence can be a bit picky at times and block your WordPress admin changes. This is really annoying, especially if you are not patient enough to let Wordfence’s ‘Learning Mode’ run its course fully. 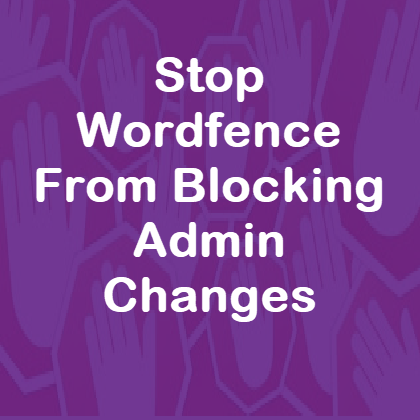 So, how can you prevent and completely stop Wordfence from blocking your administrative actions? The simple answer is Wordfence IP white listing for admins. In my experience, Wordfence in some cases does not provide a whole lot of detail when it blocks one of you admin actions in WordPress. Actually, I recently had this happen with another websites of mine and the Wordfence blocking error message was simply a date and time stamp in the top-left corner of the screen. However, without much to go on my suspicion was the ‘blocking error’ was not random, but rather a result of Wordfence thinking my actions were malicious… and my suspicion was right. Go to IPChicken.com. Your IP address will be displayed in big blue letters. Copy your IP address. In WordPress, select Wordfence > Firewall > Advanced Firewall Options. From the ‘Advanced Firewall Options’ section, paste your IP address in the ‘Whitelisted IP addresses that bypass all rules’ field. Click the ‘Save Changes’ button in the top-right corner and you should be all set. The following is a Wordfence settings video tutorial. I skipped to ’13:58′ in the video where the Wordfence IP address white listing instructions first start. What is next after white listing the IP address in Wordfence? Clear your website cache after your IP address is white listed. A simple way to force a browser cache refresh is to press ‘Ctrl + F5’ on your keyboard, or clear the cache and temporary files via your browser settings. At this point you may be prompted to login, but any WordPress admin actions that were previously blocked by Wordfence should no longer be rejected. I hope this article helped you learn how to whitelist your IP address in Wordfence to prevent admin changes from being blocked. Some Internet Service Providers (ISP’s) may change your IP address a few times throughout the year. When this happens, you will need to perform the steps above again to stop Wordfence from blocking admin updates. Did this article help you stop Wordfence from blocking changes you were making to your WordPress website? If yes, please help others find this article by sharing it with your friends on social media, or link to this article from your website or blog.